Sometimes we just need to be reminded that even our smallest actions can make a difference. 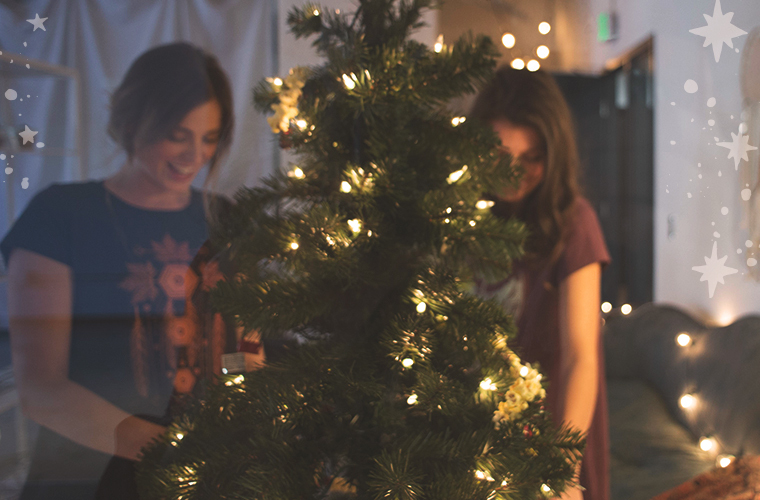 Here are 4 reasons to shop at Soul Flower (and other ethically made products) this holiday season. The best gifts are ones that have a good backstory, right? That’s why heartfelt homemade gifts are always so appreciated! 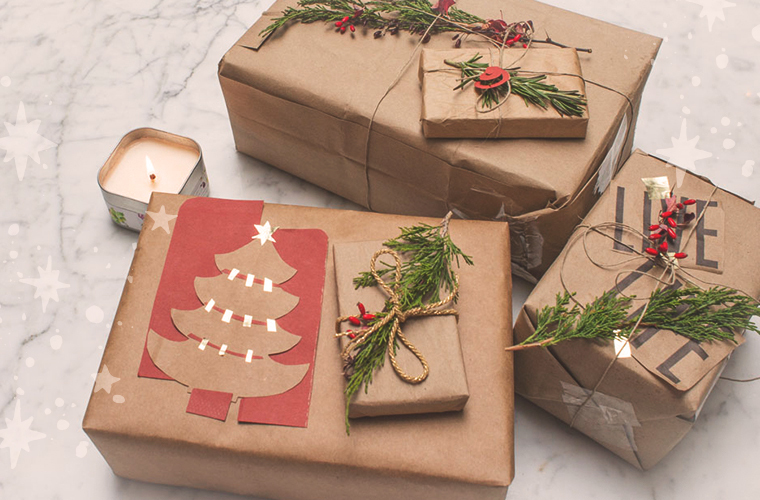 If you’re not making it yourself, the next best thing is to buy a gift that was mindfully made and has a cool story. Everything at Soul Flower has a story, whether it be eco-friendly features, hand drawn artwork, being handmade by indie artisans, or screenprinted in Minnesota. The holidays are a time when we spend a lot of money… what if even a fraction of that was spent more mindfully at businesses trying to make a difference? It’s true: we vote with our wallets. When we support brands creating eco-friendly products, more eco-friendly products will be made in the future. When we as consumers start asking questions (where are your products made? what are your sustainability initiatives? why don’t you use organic cotton instead of conventional? ), companies learn what we’re looking for and will (hopefully) strive to meet demands. Here at Soul Flower, we have an eco mission. 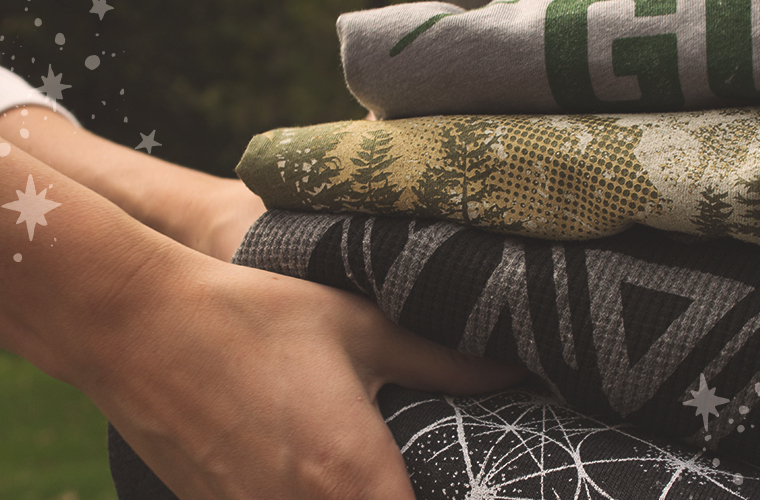 We strive to make the world a better place by choosing toxin-free organic cotton and recycled polyester. We reuse packing materials, use recycled paper, and give back to our local communities. We encourage you to do what you can. We know our customers are always on the lookout for something funky, unique, or just screams, “that’s totally ME!” We cater to boho souls and free spirits, as well as eco-minded fashionistas looking for something classy that’s also ethically made. If you’re looking for something you’ve never seen before, try Soul Flower! 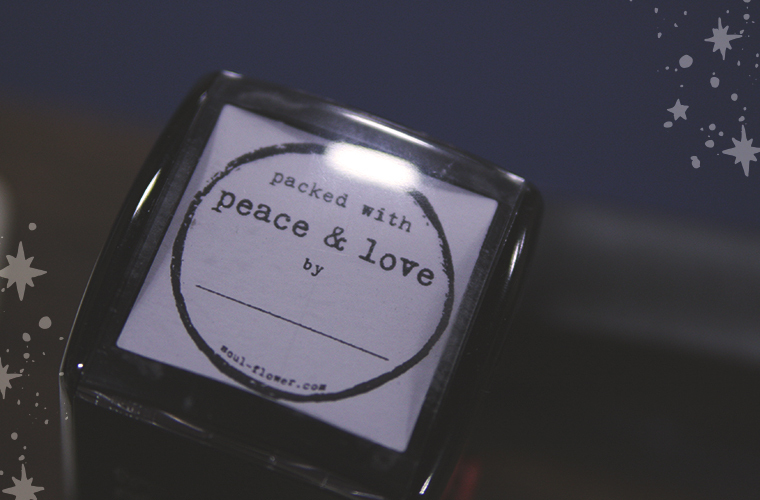 We’re still small, which means our Soul Flower brand goods can’t be found just anywhere. And our screenprinted art is completely unique, made by our in-house artists. We also carry a carefully curated selection of gifts made by indie artists, Fair Trade brands, and other small businesses. Some goodies are only available in limited quantities, so if you love it– don’t hesitate! Small businesses (fewer than 500 employees) keep our communities interesting, diverse, and vibrant. They’re run by people you know and who know you. They provide jobs in your city and the money you spend there circulates locally. Soul Flower is a small business with fewer than 20 employees. Our shop was started in 1999 by the young ma & pa team, Peggy and Mike. Since then we’ve expanded from a small hippie boutique to a full-fledged online store and organic brand. We’re located just outside Minneapolis in Golden Valley, Minnesota. We strive to stay true to our humble roots and keep customer service and our eco values at the heart of everything we do. You can know that by shopping Soul Flower, you’re supporting a small business run by like-minded buds! Starting the day after Thanksgiving comes a whole slew of retail shopping days. You’ve heard of Black Friday and Cyber Monday. 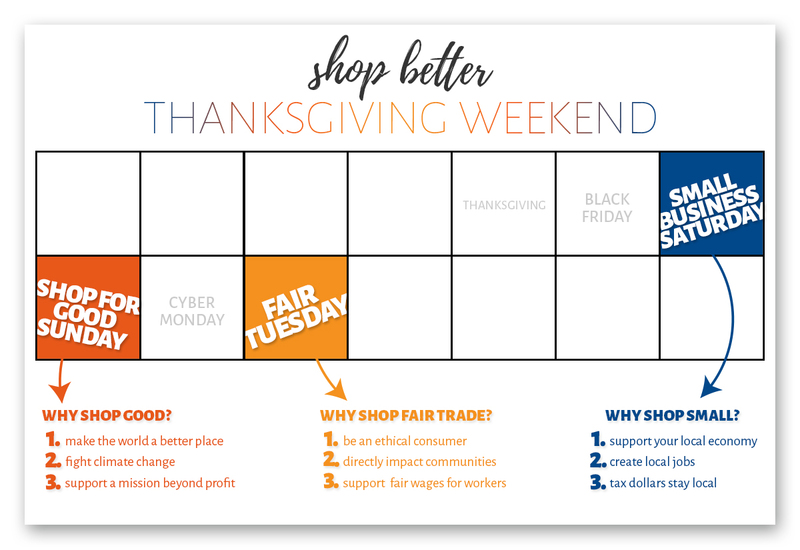 But what about Small Business Saturday, Shop for Good Sunday, and Fair Tuesday? 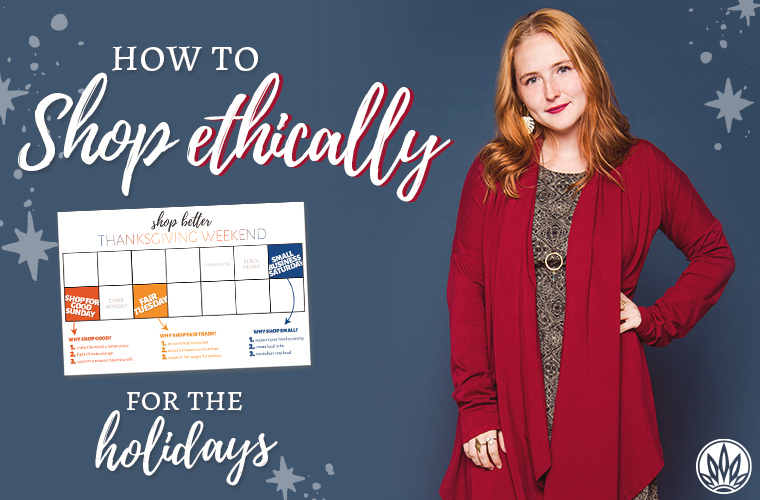 You don’t need to shop on exactly those days to make a difference, but consider what the days are promoting: shopping locally, supporting businesses trying to make the world a better place, and buying ethically-made. All good things!